Like a quiet yet substantive moment spent on a lazy summer weekend, this film takes you into specific moments that bring you to another person’s life. Not only does it make you understand, it makes you feel what it means to understand love and loss. I’ve seen this referred to as a “mood film,” and I would say it certainly is more a story about emotion rather than a story. (Cerniglia, para 1). 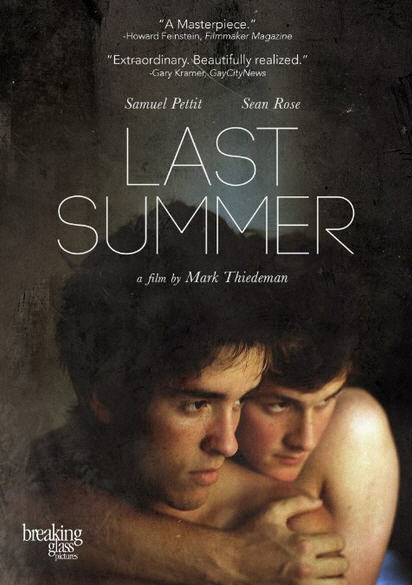 Luke and Jonah know that they will have to separate at the end of the summer, but that’s not really what this film is about. This film is about how it makes you feel. Imagine if you were in love with someone. Not the crazy passion that accompanies the start of love, but the pure and unconditional kind where you are completely secure with that person. It’s the kind where you are so content on multiple levels that you are at peace when you are with them. It’s the bond that exists between two people through a lifetime. This is what exists between Luke and Jonah. They’ve been friends since they were four years old, and love has sprung from a deep connection. What struck me in this was the depth and maturity of their relationship. There is an understanding between them that almost transcends reality – when they are together they are in their own world. And it’s a nice one. But we can sense there is confusion under the surface when they are apart. Of course they are each individually torn about losing each other. There is only one scene where this is made explicit, but there are many shots that give you this feeling. One is where Jonas wakes up with Luke, then goes outside wandering during a thunderstorm – we see him juxtaposed against the stormy clouds. There is also a constant reminder about time and it’s passing. Sometimes it’s a grandfather clock in the background. Other times its explicitly an image of a clock. And we have the idea of stopped time through Luke’s photography. He’s taking photos of things (and of Jonah) to try to freeze them in time. Interestingly many of the things he’s photographing are already frozen in time. We also have the conflict between two ideas of personal growth and how that relates to being at peace with yourself and the world around you. Jonah says, “Some people feel so comfortable in one place and others feel trapped.” This also plays into how sometimes the more simple things in life have more potential for happiness. Obviously, this film is very multilayered and complex, yet poetic in its presentation. Long, still or single action shots give the viewer a sense of peace and tranquility that exist in Luke and Jonah’s world. Still others show us the sadness at losing something so completely irreplaceable. Some shots may seem extraneous, but others give the viewer a deeper understanding of the emotion behind the characters. Like most American movie viewers, I’m too used to quick moving stories and non-stop action. Impatience is not a part of this cinematic experience, so I recommend you are in the right place for yourself to appreciate this film. It may test you in the beginning, but if you let yourself be taken in by it you’ll be glad you did.